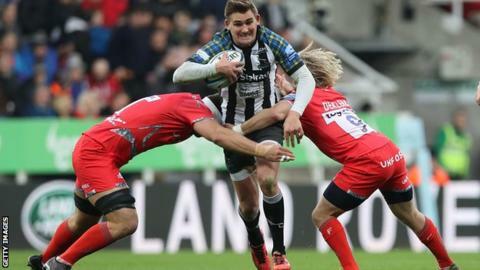 Bottom-of-the-table Newcastle fought back to win a feisty game against Sale at St James' Park in which Falcons lock Calum Green was accused of biting. Sale's Rob Webber made the allegation after a first-half clash, but referee Craig Maxwell-Keys ruled there was no clear evidence to take further action. Sharks led 10-6 at the interval, with Denny Solomona scoring the only try. But Toby Flood's try and Tane Takulua's reliable kicking earned a vital win despite Byron McGuigan's late score. Takulua slotted a total of six kicks as resilient Newcastle scored 16 unanswered points to recover from 10-0 down after 15 minutes. And they held off a strong finish by Sale, who scored late through McGuigan's well-worked touch down in the corner, for a third consecutive win, to stay within one victory of second-from-bottom Worcester. It is the second year that Newcastle have played 'The Big One' at the home of their football neighbours Newcastle United and a crowd of 27,284 were treated to a thrilling encounter. Sharks began impressively, taking full advantage of some erratic kicking and a tendency to overplay in the wrong areas to take control. Solomona's score in the corner, after a great break by Faf de Clerk, rewarded the early pressure, but two Takulua kicks got the hosts back on track. The main talking point at the break, however, was the incident which saw Webber pointing to a mark on his arm as he clashed with Green. Within a couple of minutes of the restart a fine break by the excellent Sinoti Sinoti led to Ben Curry being sin-binned for holding up play. Sale paid the price when a stylish step inside and powerful finish by Flood put the hosts ahead. The boot of Takulua stretched the lead to ultimately secure victory, despite a nervy last two minutes following McGuigan's classy finish. The bottom eight clubs are now separated by only 12 points, with Sale in sixth, nine points adrift of fourth-placed Harlequins. "We are aware of the bite allegations and we'll be having a look at that. An allegation has been made and I'll look very closely at it. If there is anything in it I'll expect a citing and then we'll deal with it in due course. "But we'll also look very closely ourselves when we get all the angles on it and the recordings. We'll look at it and see if anything needs to be done in due course. "We enjoy playing here. The atmosphere was fantastic and the supporters were unbelievable. Momentum is everything so I think we're doing all right. We set a target of five wins and we're three into that. If we get another two we should be somewhere near being safe but then, with Worcester winning, even that's not sure. "I've said it all along this year. Whoever goes down it will be a really good team that is going down because there are 12 really good teams out there. I just hope it's not us that do go down." "Rob Webber got a bite mark that needed treatment at half-time and after the game. The citing officer will have to have a look at it. He'll decide what happens. "We couldn't see anything from where we were but there is clear evidence of a bite mark. I don't know who was responsible. I couldn't see the incident - I was 60 yards away but the referee was two yards away and he said he couldn't see it. "Rob has clearly gone to the referee and shown him the bite and it's bleeding and the referee said there's no clear evidence, but what more evidence do you need? I must be on a different planet to those three officials. It's madness, but we'll see. "We can't detract that from the result. We took some poor options in the first half and fair play to Newcastle, they battled hard and went in just 10-6 down and we couldn't match their enthusiasm in the second half which was very disappointing. They deserved to win, the disciplinarians will take their view on it and we move on." Newcastle: Hammersley; Goneva, Harris, Matavesi, Sinoti; Flood, Takulua; Lockwood, McGuigan, Mulipola, Green, Davidson, Graham, Hardie, Wilson (capt). Replacements: Cooper, Brocklebank, Wilson, Olmstead, Chick, Stuart, Connon, Williams. Sale: James; Solomona, O'Connor, van Rensburg, McGuigan; James, de Klerk; Harrison, Webber, John, Beaumont, Phillips, T Curry, B Curry, Ross (capt). Replacements: Langdon, Bristow, Jones, Evans, Neild, Warr, Redpath, Reed. Sin Bin: B Curry (42).